AVSIG: The Fairchild T-46A - What Happened? The Fairchild T-46A - What Happened? In the late 1970s the USAF decided to develop and purchase a new trainer which would combine all of the T-37 part and most of the T-38 training regime. Unlike the T-37 it would have a much higher transit speed and even more important the altitude it would train the pilot at: 47,000 feet. And it a lot less fuel and hours per hour costs. But then something happened. The USAF was never clear about why they canceled the only new trainer being developed in the US since before the Vietnam War. All other trainers were developed from over seas designs. Some say the T-46A was canceled to prove that the Reagan administration could cancel some weapons projects. And the T-46A was one of the only two "major" weapons canceled by the Reagan administration. 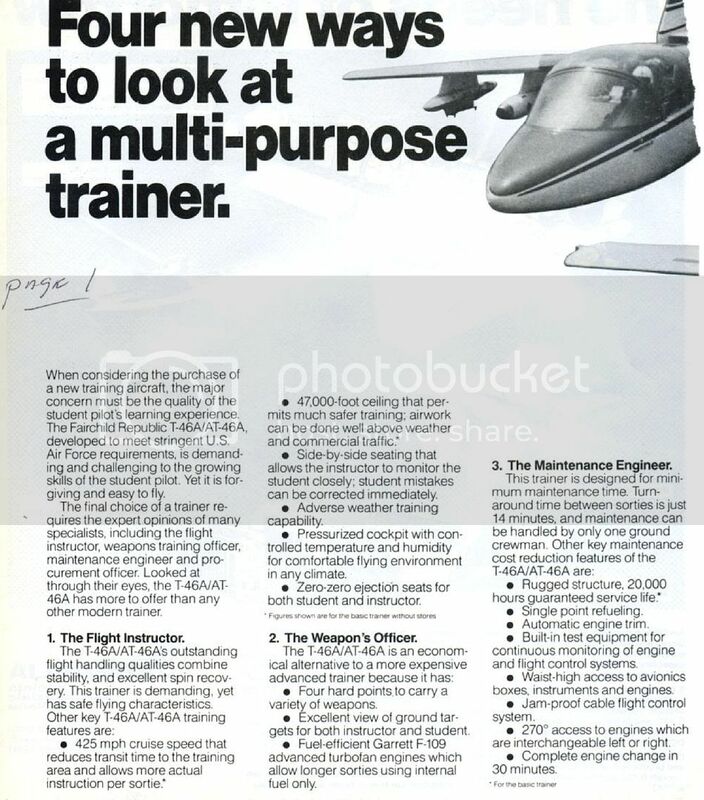 Below are two pages from a aviation publication in 1984 on the T-46A. I am probably wrong, but I think what ever the short comings or problems were they could have been worked out and given the USAF the trainer they needed for the next three to five decades. And in my opinion Fairchild was not the type of company that would design a dog. Any opinions or comments appreciated. And when I find the info that Fairchild sent me, I will post it. The engine was a poor performer and the USAF was already considering an engine upgrade. nd the Navy, smelling a real wet dog, had absolutely NO interest in the -46A. Then too, some choked on the name "Eaglet". And when the Air Force killed the Eaglet, it was the end of Fairchild Republic. How did a famous company like Fairchild design such a dawg? And while I can "maybe" understand the bad flying characteristics, how does a simple trainer design require $3.4 billion! I mean almost all trainer designs are a private funded development -- ie with the idea that if we can not sell it to our government we can sell it to some other government. Originally it was argued the T-46 program would cost LESS than any upgrade to the -37 and would offer a longer life with lower operating costs. It was supposed to be a win-win. According to some reports, some mods included new engines for the -37 (none specified) and extending the service life. Of course, at some point in time someone was going to have to address the fact that the final turn for landing in the -37 put the pilot outside the ejection seat envelope. The -37 seat was NOT a zero-zero seat and the normal sink rate on final placed the pilot in jeopardy. Jane's reports in Mar86 that the CBO said the USAF could extend the -37s for $1.2 billion less than acquiring the -46A which by then had taken on the nickname, the "Thunder-piglet" in line with Republic aircraft being named thunder-something. Like Beech, Fairchild Republic had Rutan build a 62% aircraft and the numbers looked good. But poor engine perf, bad cost over-runs, poor management of the program doomed the little pig. How did a famous company like Fairchild design such a dawg? 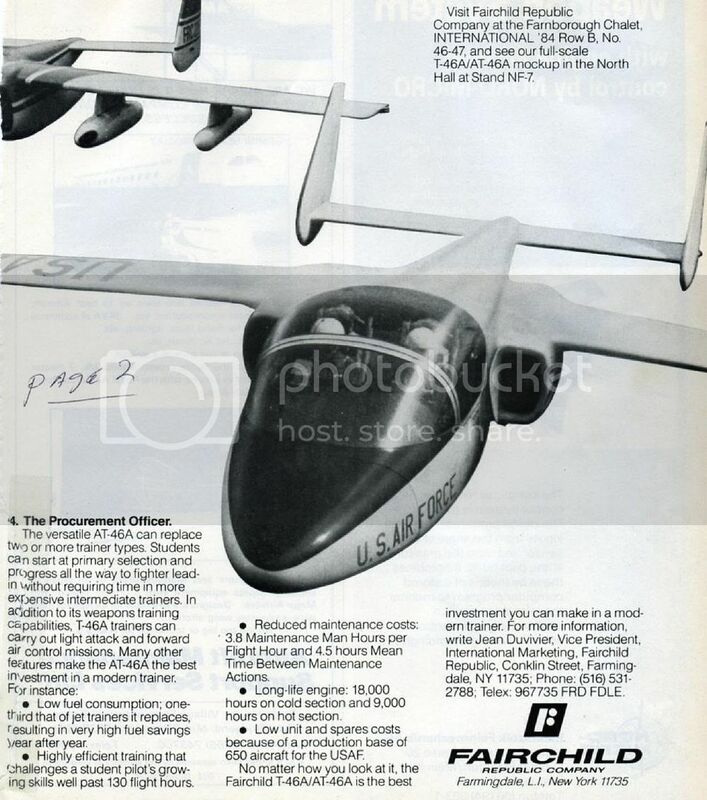 "If they ever build a runway that goes around the world, Fairchild will build an airplane that uses every inch of it." What the hell is an "aluminum falcon"? Tell me one company that hasn't? The same can be said for Consolidated Vultee and the B-32. They had the -24 design locked down. Interesting wing, good performance but with some problems. Then they get the default position for backup on the B-29 when Lockheed and Douglas back out of the competition. The -32 comes up like a bunch of rookies with NO experience designed it. Take the cowl flaps for instance. There were controls for the UPPER and LOWER cowl flaps.. 8 switches. ?? The pilot's seat was also screwed up. Raise the seat to see outside the cockpit and you had virtually no scan inside for instruments. Lower the seat to see the instruments and you could not see out. ??? The pressurization sys was so bad they junked it and went with an unpressurized airplane, especially after LeMay decided to take the -29s in low. And on and on and on. And performance was atrocious when it came to range, speed and altitude. None were met as I remember. One has to wonder if taking them all to Walnut Ridge soon after the war was a routine reduction or revenge. At any rate, the entire fleet was quickly chopped up including some that were mostly brand new with very few hours on engines or airframes. There were controls for the UPPER and LOWER cowl flaps.. 8 switches. ?? Considering the cooling problems they had with the R-3350's, I'd think that could come in handy. The pressurization sys was so bad they junked it and went with an unpressurized airplane, especially after LeMay decided to take the -29s in low. I thought that decision was made as soon as the B-29 was selected as primary, as a low-tech fallback in case the B-29's pressurization and remote turrets didn't work out. Too complex and a single switch worked better. The crews found it a problem in flight test. In a way you are correct but the ORIGINAL airplane was to have pressurization just like the -29. And as you have noted, they decided after the -29 experience that the -32 didn't need the complex remote turrets. The -32, as most here know, is unique in many ways. The last combat sortie in the Pacific, last aerial engagement with 2 Japanese fighters claimed, the last airman killed in the Pacific and one of the few airplanes where NONE are left. ALL cut up and destroyed. Fly The Airplane As Far Into The Crash As Possible. - Bob Hoover 1922-2016 R.I.P. This is the one with the single tail. That was the third, if I have it correct, bird. The first two came with twin tails like the -24. I had forgotten the trim for the elevator and ailerons worked in the opposite direction of other airplanes. On the mixture, full forward was CUT-OFF and full aft was AUTO-RICH. The flaps switch was three position (up, off and down) and there were two switches, one for inboard and one for outboard flaps. The switch moved left right instead of up-down. ?? also, to raise the gear, you pushed a button which released a lock which allowed you to raise the gear with another handle and then another switch closed the gear doors. ?? 3 steps for raising/lowering the gear. Huh??? My father-in-law was with a b-32 unit as a belly gunner that was preparing to fly to the Pacific when the A-bombs were dropped. It would have seem the problem with the ejection seats could have been handle fairly easy -- ie new ejection seats. But the problem of the pressurization to operate at 47,000 feet and a higher transit speed is a different issue. Finally, why did Fairchild design a totally new plane and just not contact Saab and co develop a version of the SAAB-105, which is the T-46A looks and awful lot alike. <GRIN> The SAAB-105 is one of the better jet trainers, only came to late and from the wrong country. That mixture deal sounds really dangerous, though. I don't think the T-46 would have gone to 47k. The highest I ever got the -38 was in the low/mid 50s and that was a zoom climb that left me with a glider until I got back into the mid 20s. And retrofitting a seat would not be easy or without considerable costs. The -37s ejection seat was a 37mm shell which kicked your *ss. I got to fly the -105 in Sweden with one of the Saab pilots. (wish it had been the one made in Farmingdale but this one was made in Linkoping). Anyway, it was a very docile and sweet handling little bird. We went on a low level cross country with us going in the back door and out the front door of some of the red topped Swedish homes in the country. We were down in the dirt. The Swedes pride themselves on their low level flying and from my short flight, I can see why. Re the gear, you've probably flown a DC-3/C-47/R4D, and that's with no gear doors at all. You just have to wonder what they were thinking. It was not like they were newbies to building airplanes but there were SO many things wrong. And no doubt, you know that prior to tactile coding and some standardization of what was where, pilots transitioning from one airplane to another would often revert to old habits... another airplane lost. For example, let's take this page at my old UPT base, Webb at Big Spring. Just check out the wad of metal (and wood) they were making. I understand the B-29 FE position could get interesting in that regard -- aft facing, pull the throttles for power. It was interesting to see all the 'flaws' that people think caused the end of the T-46 program. That wasn't what it was all about. I was a project manager at Fairchild during those days. A requirement of the T-46 contract was to install and use an earned value tracking system for the first time in Fairchild's history, The first report from the new system declared that the T-46 program had a schedule variance equal to about one month's effort and a cost variance to match. The Bethpage plant general manager declared that the data was faulty and ordered the project control folks to edit the reports to show no variance. Rather than risk their careers on the data from a new system, the reports were edited. This continued for the next three years. The EVMS showed the project slipping further and further behind. The plant manager kept insisting that the reports be edited. The day of the roll out came. The project was 10 months behind schedule, the plant manager allowed the roll out to go ahead as scheduled. The Air Force was either tipped off, or smelled a rat from the reports that showed no variances. They came to the roll out with screwdrivers and wrenches. They removed maintenance access panels and discovered wooden mockups of avionics boxes and fly-by-wire controllers that were critical to the operation of the T-46. The commanding general met with the plant manager and told him that there were two options. The plant manager could personally take the plane up and demonstrate its flight worthiness, or Fairchild Republic could make it flight worthy. But, since the official reports said the plane was complete at roll out, there would be no progress payments until the T-46 flew. If the T-46 did not fly, the plant manager and project control group would all go to jail and the company would be disbarred from future government contracts. Three T-46 test aircraft were eventually produced, but the expense of funding 10 months of effort with no income drained Fairchild. The company defaulted on commercial loans and on a contract with Saab. Saab and the banks forced Fairchild Republic to liquidate its assets to pay damages to Saab and satisfy the bond holders. No more Fairchild Republic; no more T-46. You can quote me on that. I was a project manager at Fairchild during those days. Welcome to Avsig. I see you’re registered as (Public Guest) Join up, be a regular, and share what you know with us. Lot’a fine people hang out here on the longest, continuously running internet forum. I know that over the years we’ve all learned a lot from each other. What Tom said...you clearly have a lot to offer this forum. I'm an engineering prof and open all my courses with a presentation on "Ethics and Competence in Engineering" -- I think your T-46 narrative will fit nicely into it. Be advised: John Wiley, whom you were replying to, passed away about three years ago. Quite a loss to us. Mmmmmhm? All our DC-3s and every Wright 1820 powered Diesel 3 were also that way. And also the B-29. B-29.....pull the throttles for power. Unh, unh - "sorry Charlie, no cigar". Not so. BUT, all the switches are backwards, 4-3-2-1. OK, must have misunderstood what I read on that. So the pilot's throttles and FE's throttles move in opposite directions relative to the airplane? Also, that reminded me of those T-6s from the movie Tora-Tora that Jerry Weeks had donated to us in the CAF and that ultimately formed the CAF Tora-Tora deal. French types (NOW I know) with the throttle quadrant stuff reversed. I tried and tried to keep one running when I put the mixture in RICH at West Memphis and couldn't, quit every time, I went inside the FBO and called Rolling Fork and got either "Buck" Rodgers or Dudley Johnston at South Delta Dusters and told him it wouldn't keep running. He listened and then told me to "just put the d--- mixture in the middle position, they run too d--- rich anyhow and get those d---ed things out'a there quick before he changes his mind". A fascinating (if sad) story. There are pictures of the prototypes in flight. Do you know if the aircraft met its specifications? Did they ever fly the full sized aircraft? I remember seeing the part sizes version built by Scaled Composites (Burt Rutan). One of the airframes is at the USAF Museum, but you have to take the Restoration Tour to see it. 0 registered and 21 anonymous users are browsing this forum.